Jelly rolls, Layer Cake, Charm packs. Yes, I have a sweet tooth but I also love some patchworking! Let’s have a look at these different fabric bundle types and what you can do with them. Jelly Rolls are so versatile and really simple to use. You can make a range of quilts from easy to moderate. The blanket on the left is one of two made from a single jelly roll! 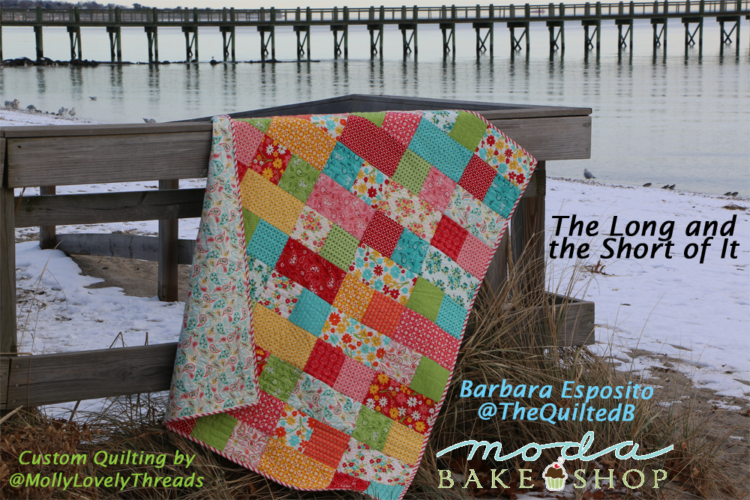 You can get the pattern on the right free from the Moda bake shop here. The great thing about charm packs is you get a large selection of fabrics in a size commonly used (minimising cutting and measuring) at a very affordable price. We have a lovely selection of charm packs in our shop and you can find this pattern, for free, here. Similar to charm packs but larger in size the layer cake comes in collections of complementary fabrics. A useful size that can be halved, quartered or used whole for alternating patchwork. You can get this pattern free here. Most patchworkers are familiar wiith the fat quarter. It is a meter squared, slightly longer than wider (hence the “fat” bit!). You can buy fat quarters as co-ordinating packs or singles making these particularly versatile. Pictured on the left is a cute zippered bag made from fat quarters in green from our shop and the free pattern for the quilt on the right can be found here. What better way to spruce up your house with a gorgeous summery quilt or fashionable accessory. That’s why we have an offer of a free pattern if you buy the materials in our shop. New to patchwork? Want to try something new? not a problem. We will walk you through it step by step and make sure you have everything you need.